Our online portal for information technology security videos had a mandatory upgrade and was not available over the past couple months. Good news – the videos are once again available for you to enjoy! We have partnered with the SANS Institute to provide this content, which is why you’ll see the SANS logo all over this portal. To access the Technology Security Videos, please visit the Evergreen Human Resources Training site at www.evergreen.edu/humanresources/training and look for the Technology Security Training link under the list of Online Training. You will use your Evergreen username and password to login to the portal. We have partnered with the SANS Institute to provide this content, which is why you’ll see the SANS logo all over this portal. For those of you who used the previous portal, you will notice a substantial difference in how the site looks and refreshed security videos for the 2017 year. Please contact the Help Desk via help.evergreen.edu or at 360-867-6627 if you have problems accessing the training portal. This entry was posted in System Updates on March 7, 2017 by danielj. Beginning Monday, October 3 the Time and Leave system at Evergreen will have an updated look and some enhanced views for supervisors. Computing and Communications, in partnership with Human Resources and Student Employment, is very excited to report that the Adobe Flash dependency that prevented many of us from accessing our Leave Requests or Time Tracking on mobile devices like smartphones and tablets is no longer an issue. Updated help articles, including videos, will be available via the Computing Wiki at http://wikis.evergreen.edu/computing/index.php/Time_and_Leave_Help. Enjoy! This entry was posted in Featured, IT Projects, New and Cool, System Updates on September 30, 2016 by danielj. This is information on a recent issue we experienced with Sophos, the anti-virus program we use on our computers here at Evergreen. This message primarily applies to Windows-based computers. Some of you may have noticed Sophos notifications on your computer this afternoon in the form of a balloon in the bottom right-hand corner of your screen (most were referring to an item called ‘Shh/Updater-B’). These notifications reported potential threats to your computer. However, there is NOT a virus going around campus and you computer is not at risk by this ‘threat’. This desktop notification was caused by an update that Sophos released earlier today that inadvertently views all updater programs as a potential threat, which causes the notification message to open on your desktop. Sophos is currently working on an update to resolve this. We are working on turning off desktop notifications from Sophos until they resolve this issue. You do not need to take any action on these messages; simply close Sophos and continue working. If you encounter any issues or have other concerns, please contact the Help Desk at 360-867-6627 or via email at support@evergreen.edu. This entry was posted in System Updates on September 19, 2012 by danielj. I’m pleased to announce that we are going live with Sophos Anti-Virus! This post will provide information on how you can upgrade to Sophos and what you can expect from the process depending on the type of computer you have. If you have any questions or concerns please don’t hesitate to contact our Help Desk (support@evergreen.edu, 360.867.6627). Windows XP/7: We will be pushing Sophos out to your computer. The install process does not require a computer restart and you can continue working while the process runs through. The install process will start automatically the next time you log in to your computer. You will see a black text window (see Figure A) that will remain open while the install runs. NOTE: This process will not work if the person logged on to the machine is not an administrator. 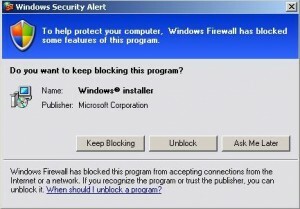 At the end of the process you will see a Windows Security Alert box (see Figure B). 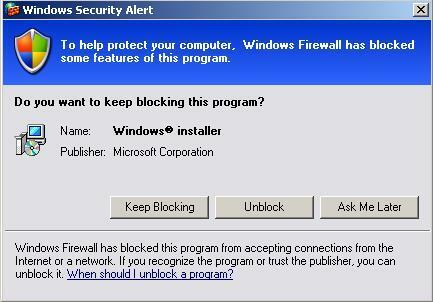 Select the ‘Unblock’ option. Congratulations- you now have Sophos Anti-Virus on your computer! This entry was posted in Featured on May 23, 2012 by danielj. This entry was posted in System Updates on May 9, 2012 by danielj.